Your fancy feline deserves only the best, and a little space to call home. To help you create the snazziest custom cat condo, we’ve researched a variety of new and bestselling products. 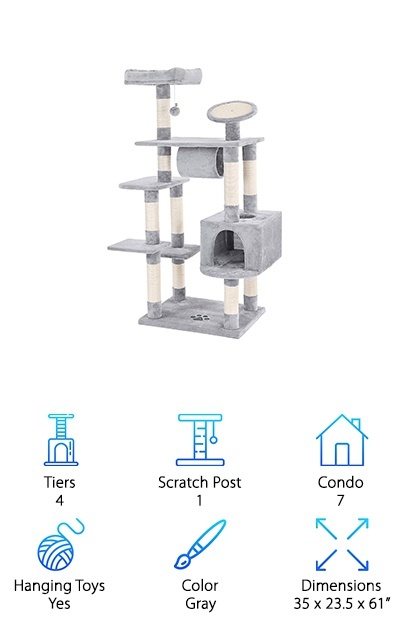 The top 10 cat tree reviews are below. It’s time to jazz up the place, and give Whiskers a deluxe suite where she can play or just relax and look at you disapprovingly. Before we get started, here’s what you need to know when shopping for cat trees for large cats. Tiers - Let Kitty reach for the stars -- or at least the catnip on top of the refrigerator – with high quality cat trees with a tier or two. We took a look at durable cat perches that stay low or go way up. 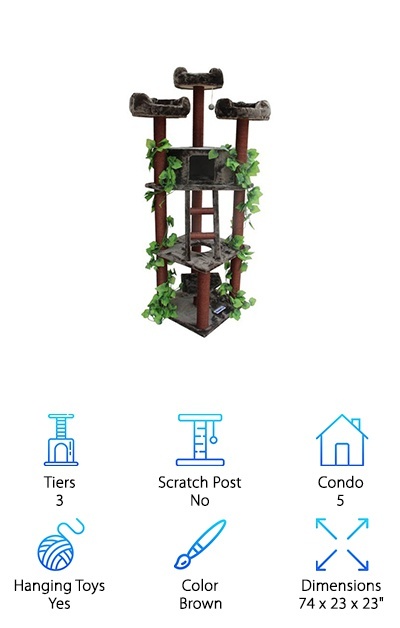 Scratch Post - Cats need to scratch for many reasons, and the best quality cat trees offer a place for them to do it comfortably. Think about it: the best cat scratch posts come with a comfy bed ready to go next door! 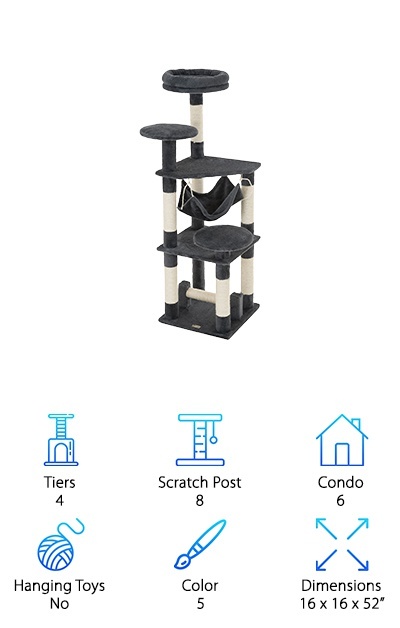 Condo - The best cat trees for multiple cats also come with multiple condos, or perches, to let each purring tabby or Siamese have their own throne. 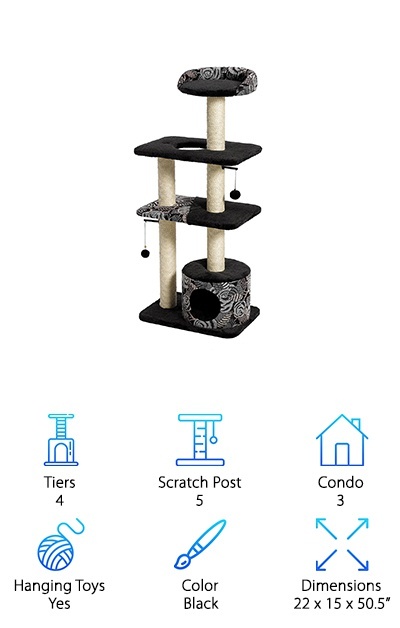 We’ll let you know how many condos come on every cat tree we review. Hanging Toys - After a long day of harassing the dog, staring out the window, and begging for treats, cats need a little R&R. Others are just getting started, and that’s why we also included the number of hanging toys available to your furry friends. Color - While many cat trees come in that classic beige, there are some more vivid options available. Just keep reading! We’ll let you know if that new pet accessory will match the couch when it’s stationed in your own home. Dimensions - Cats come in all sizes, and so do their toys. We reviewed a variety of cat trees in a number of different dimensions, so check with us to see if your favorite pick comes in a size that makes sense. Now that you’re excited to see the choices we’ve got ready for you, let’s get right to the reviews. Soon, you can have a new piece of furniture that doubles as the playroom, nap room and bedroom for your beloved cat. They’re going to love getting that little extra dose of independence. You’re going to love watching them climb and play. If you’re short on time, take a look at the top pick and budget pick. Let’s get started! We’re excited to show you some of the best cat trees for large cats. The New Cat Condos Playground is definitely one of them: it’s also one of the biggest! This is crazy: it comes fully assembled and helps your feline friend climb over 6 feet off the ground. If your cat values its independence and likes to create its own path in life, here is the cat tree you never knew you needed. It’s also great for cats with friends: with a whopping 4 tiers, 4 condo levels and a long tunnel for hiding and playing. Cats will spend hours using the two natural wood posts for scratching and the levels for climbing, hiding and goofing around. The only downside is that their dog friends will be extremely jealous. Designed in that classic and comfy beige with brown and green accents, you’ve got to check it out. What are you waiting for? Make your cat the talk of the town with this selection. The best cat tree brand will be the one where your cat feels safe and can snuggle with his pals. The Ollieroo is a great example of an affordable option for doing all of those things. It’s truly amazing: cats will have 4 levels of playtime fun. 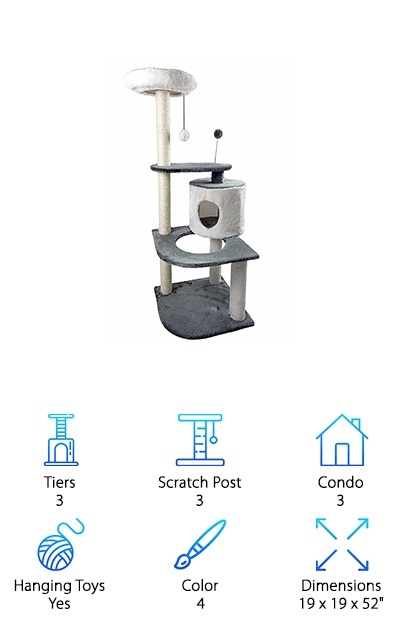 Scratch posts are set up in 8 different locations for multiple felines. And that’s not all: with a bonus hammock, there are 6 different condos for cats to take a snooze. 5 lovely color options mean you can pick the shade that best matches your home, too. You love your pet, and you only want to give them the best. So don’t hesitate! The Ollieroo Cat Tree is a winner. You’ll become a big fan of its versatility. Place it by Spot’s favorite window, and let him stalk the mailman in peace. It’ll make a practical, smart addition to your home by giving kitty a place to call their own. A definite top contender for “best cat tree for large cats,” the Songmics Large Cat Tree is a magnificent specimen. The options for cat positioning and lounging around are virtually infinite, thanks to 4 tiers of fun. At the top, a well-placed scratch pad offers a new place to sharpen claws and save your furniture. That's half the reason people buy cat trees, isn't it? To save the poor couch or ottoman that would otherwise be taking a beating! The Songmics Large Cat Tree will help keep Fluffy too busy to wreck anything as she explores. There’s a tunnel, a little house to hide in, and a bed at the very top for surveying her kingdom. Honestly, what more could you ask for? This is a tree that can accommodate cats of many different sizes. And since it will attract every furball in the neighborhood, you can attach it to the wall to make it that much safer. Why get a kitty house when you can get a kitty mansion? It’s an upgrade, to be sure. Especially when this mansion comes with 5 different beds or hideaways for lazy critters. There’s more: this mansion comes with décor, including lovely twisting vines and a ball hanging from the uppermost tier so that cats get their cardio. This reasonably-priced climber will be the talk of the town for families who have multiple cats, since they all get room to play. Watch them climb up the ladder, bat at the vines, and settle into a cozy bed from which to survey their kingdom. Any cat tree is a winner when it helps your favorite animal get some rest and stay entertained. As with all of our recommended options, place this tree next to a window so cats can enjoy the view in their new digs. Neighbors passing by will want to know how your furry friend became so stylish! The Armarkat is a truly impressive option for any pet interested in scratching, climbing, playing or sleeping. 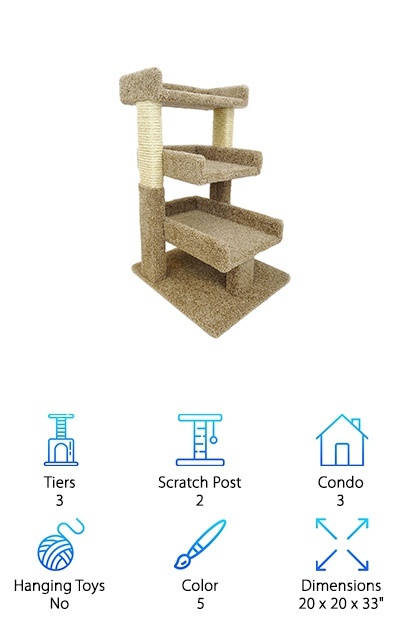 Just look at all of its features: scratch posts are included on every side of each of its four tiers. That creates 10 different spots for Miss Purr Purr to sharpen her claws. If she and her friends have had a long day chasing their own tails, they can settle into 7 different sleeping locations. They get to choose from a hammock, a bed or a hideaway hole. That cat cave even comes with a convenient “window” for spying on humans who may be approaching with treats. The Armarkat comes in 6 different colors, and each tree is differently sized and differently oriented. Isn’t that great? You’ve got so many choices to choose from! We’re sharing the dimensions and features of the largest tree for you here. Bottom line: this is going to look great in any room in your house. You know when “durable” is in the name, you’ve got to check it out. This product comes with minimal assembly needed, and lots of sisal-wrapped support posts for the most industrious feline to get her scratching done. Did you know that cats need to scratch for a whole bunch of reasons that go beyond tending to their claws? You never have to worry about that again with this tree in your corner. And as with so many of our chosen items, cats also have hanging toys to swing at enthusiastically. They have a hiding perch on the lowest level, and space to look out over the room at the top. This very affordable tree will blend in with the nicest furniture thanks to its designer fabric. Recreation and rest are just a purchase away! Pick up this cozy and ultra-soft item now and watch as kittens and older cats alike climb onboard and find their new favorite activities. This scratcher is a beautiful addition to any abode, thanks to multiple colors and design options. Select from a rich gray, browns, beiges, and an unusual and truly lovely navy blue shade. The carpet and the drapes will no longer be a target for Tigger or Smokey once they get an eyeful of their newest toy. They can saunter up sturdy ladders, find multiple cubbies for hiding away, and so much more. Check this out: toys hang from multiple levels too, so they can play, climb and nap in whichever order they please. Other models from the manufacturer feature ropes, hammocks, and other super-fun design elements. You’ll be jealous of your critter companion as he discovers new things to love, over and over again. 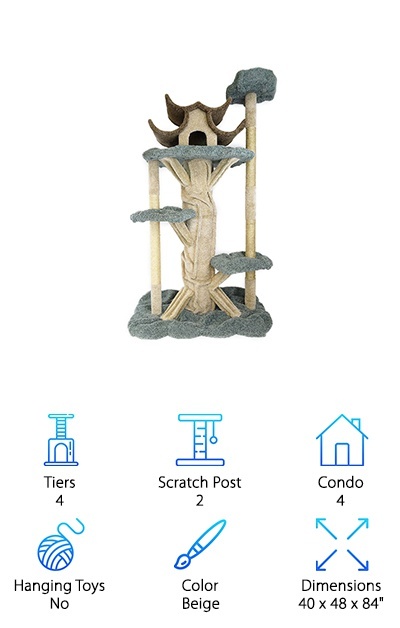 The finest homes come with the most high-quality amenities, and this cat tree is no exception. Hang up the “welcome home” sign for your pet today! It’s the gift that keeps on giving. Does your cat secretly dream that she’s a tiger? When she catnaps, do you hear growls and yowls coming from the bed? Perhaps this floor-to-ceiling cat house is the way to go to let her fulfill her wildest jungle dreams. Both standing and hanging toys are attached to multiple Furhaven models. It’s great to have so many options! After all, we know how picky Puss can be. When she’s tired of pretending to stalk her prey, she can collapse into any number of sleeping spots to dream once again. Hammocks, cubbies, and beds are all featured. Multiple cats can find room to have fun and stretch out. And there are scratching posts on every tier! What could be better? Get the present that will save your rugs and ottomans and bring your pet endless joy. After all, a happy home is a home where kitty can curl up wherever she pleases, and your lap gets a much-needed break. Sheba will finally feel like a true queen when she climbs atop this leopard-print tree. 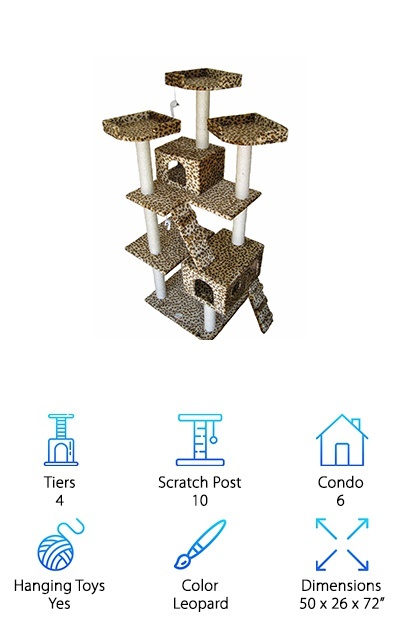 Reasonably priced and generously sized, cats will feel like royalty perched on any one of the 4 levels provided. They can keep up with kitty maintenance by utilizing any one of the 10 scratching posts, and then they can saunter to sleep by picking from one of 6 different bed options. Cat heaven must look something like this! That’s not all: the tree can support multiple larger cats who love playtime. If you’re worried your pets are running out of things to do, the Go Pet product will revitalize their free time and get them occupied again. The leopard print is definitely a highlight, and will match your room’s creams, browns and beiges effortlessly. A cat house that coordinates and keeps your animals busy all day long sounds like a real win, doesn’t it? Now, you can introduce this high-value item to your very own rabble-rousing crew. 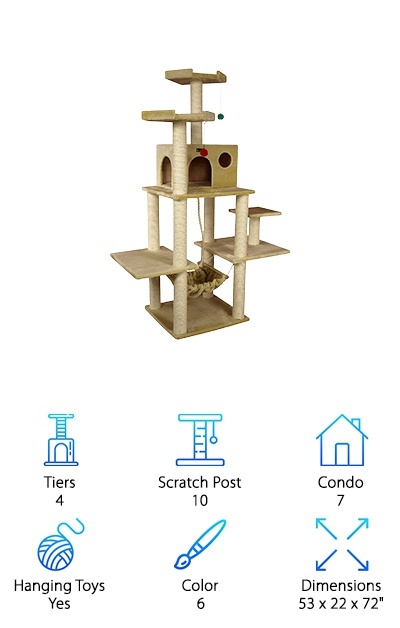 Do you want a new cat condo, but don’t have a lot of room for some of the larger perches? This is the one for you! This model proves you can choose a smaller option and still get all of the amenities you’re hunting for. It fits snugly into any corner of the room and still offers enough space for three cats seeking a spot to rest. Two scratch posts are also provided. 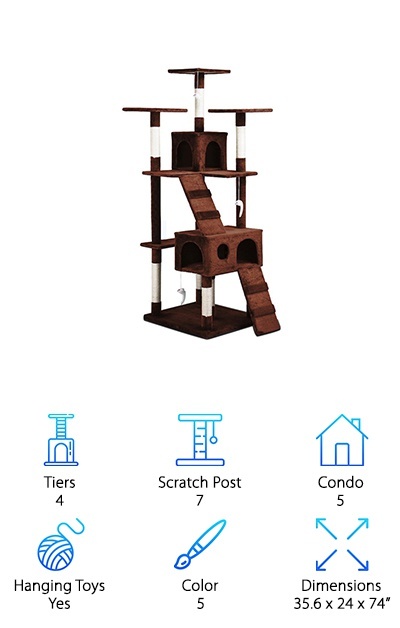 Simple, straightforward, and it gets even better: this cat tree arrives fully assembled and ready to use in 5 different color options. While some cats are solitary creatures, others love to be social, and you can position this condo in any direction for single or multiple critters. Older cats may also find it easier to climb and reach the top. Kittens, too, might have an easier time climbing and practicing their daredevil moves. It all adds up: if you want to start with something basic that doesn’t take up a lot of real estate, check this one out. Sometimes the modest choice is the right way to go.